Marshall's Code line of amplifiers show what you can do with a large library of all valve amps and an amazing team of software designers. After teaming up with the incredible team at Softube, Marshall have created the Code 25 a small and lightweight combo filled with 14 modelled preamps, 4 power amps and 8 speaker cabinets on top of 24 effects. 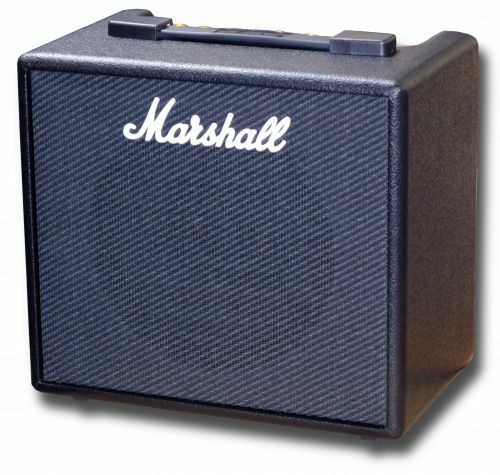 This is truly every Marshall in a box. We can't believe just how many different amps Marshall and Softube worked on modelling and just how good the models are. The 14 MST preamp modules cover everything from classic Bluesbreakers the hard rocking JCM800 and even up to modern JVM and DSL tones. Cabinet wise they again have covered every kind of cab Marshall make from the small 1x12" 1912 to the mammoth 4x12" 1960A. The final part they modelled was the power amplifier. Here you have four main options based on the different kind of amps you will see day to day. The EL34 filled Marshall 100w, 5881 filled Vintage Marshall 30w, a more american A/B 5881 Power amp and a small British Class A EL84 designed option. These can all be mixed and matched to form your dream Marshall tone. The Code 25 is the smallest in the family and with 25w of power is perfect for home and practice as it can actually get pretty loud. Fitted with a 10" driver this small little combo can push out some serious volume and at great quality. Because the amplifiers, cabs and power amps are all modelled you don't lose any of that low end rumble that 12" speakers give with normal guitar amps. So to give you more control over the sound than Marshall could physically fit on the top of the amp, the Code series use an app for when you really need to dig in deep. With this app you can on the fly change your settings, create presets, manage the amp and even stream music straight to the amp via Bluetooth. CODE has 14 MST preamps, 4 MST power amps and 8 MST speaker cabinets. It has 24 FX including: Compressor, classic stompbox Distortions, Auto Wah, Pitch Shifter, Chorus, Phaser, Flanger and Tremolo. It includes Delays with Tap Tempo, and studio quality Reverbs. CODE's MST preamps produce some of the most acclaimed and best loved Marshall tones: JTM45 2245, 1962 Bluesbreaker, 1959SLP Plexi, JCM800 2203, JCM2555 Silver Jubilee, JCM2000 DSL100, JVM410H and more. CODE features EL34, 5881, EL84 & 6L6 MST power amp voicings, and MST speaker cabinet models: 1960, 1960V, 1960AX, 1960HW, 1936, 1936V, 1912 & 1974X. Connect via Bluetooth to control CODE and to stream music from your iOS or Android device using the GatewayTM App. Connect via USB to use CODE as a DAW interface to record, and to stream audio from you computer. Connect your MP3 player via CODE's dedicated audio input to jam along with your favourite tracks or plug headphones in for a personal CODE experience. Connect CODE's programmable footcontroller* to assign up to 30 Presets or control panel functions.